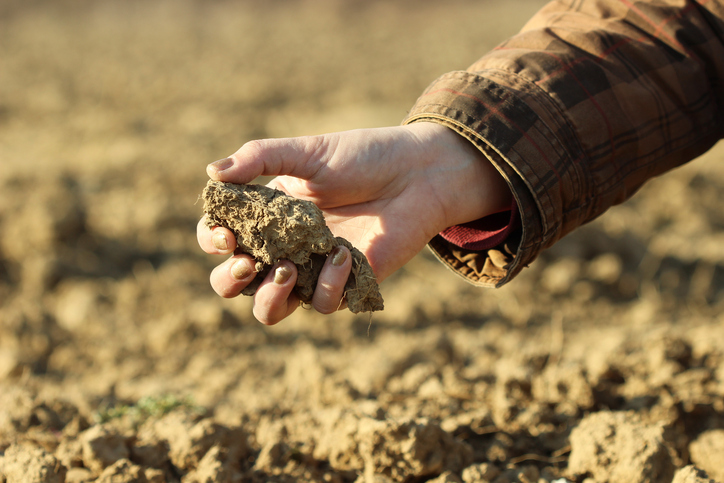 A clod is a lump or a mass of soil or earth and it can also be used to mean ‘soil or earth’ in general. Clod can also be used figuratively to refer to the human body, as a literary term, in reference to humans having been created by God from the dust of the ground. Informally, you can call a stupid person a clod. Unrelatedly, a clod is a meat cut, from the shoulder of beef. The farmer picked up a clod of earth and threw it at the birds who were eating his seeds. A team of horses dragged a plow across the clod. The young man cursed the day that his noble soul had been yoked to this ignoble clod. You great clod! What do you think you're doing?! The butcher sold the customer a clod of beef. The insult can also be clodpoll, clodpole, clodplate, or clodhopper. To clod can also be a verb, meaning ‘to form clods’ when we are talking about soil, although it is not commonly used. Historically, the verb could also mean ‘to remove the clods from,’ when talking about a piece of land. Clod, meaning ‘lump of soil or clay,’ dates back to the early 15th century, as the late Middle English noun clodde. The noun comes from the Old English prefix clod-, found in compounds such as clodhamer (a type of thrush, literally ‘the field-goer’). It can be traced back to the Proto-Germanic kluda-, from the Proto-Indo-European root gleu- (‘clay’ or ‘to stick together’). It is related to the Dutch cloot (a ball), the Danish klods (a lump or block) and the German Klott (a lump or block), as well as many English words, including clay, cleat, cloud and even gluten. It was completely synonymous with the word clot until the meanings separated in the early 18th century. The figurative sense ‘person’ or ‘the human body’ first appeared in the late 16th century, but it has been used to refer to a stupid person since the early 17th century. The verb dates back to Middle English, and could mean ‘to form into clods’ and ‘to coagulate,’ as well as ‘to break up clods after plowing,’ but the first two senses are more commonly used now for the verb clot, and clod as a verb is now very rare.